M T D O c t o b e r 2 0 1 8 72 F o c u s O n I n d u s t r y A utomotive Aermarket Products Expo (AAPEX) 2018 will be presented Tuesday, Oct. 30, through ursday, Nov. 1, at the Sands Expo in Las Vegas. AAPEX is part of the Automotive Aermarket Industry Week (AAIW), which also includes the Specialty Equipment Market Association (SEMA) Show going on at the same time at the Las Vegas Convention Center. e Tire Industry Association's Global Tire Expo is part of the SEMA Show (see a schedule of events in MTD's September issue.) AAPEX is a trade-only event and is not open to the general public. It is co-owned by the Auto Care Association and the Automotive Aermarket Suppliers Association (AASA), the light vehicle aermarket division of the Motor & Equipment Manufacturers Association (MEMA). AAPEX 2018 will feature more than 2,500 exhibiting companies displaying the latest products, services and technologies. More than 47,000 targeted buyers are expected to attend, and approximately 162,000 automotive aermarket professionals from 135 countries are projected to be in Las Vegas during AAPEX 2018. Exhibits will be open from 9 a.m. to 5 p.m. Approximately 50 educational sessions will be presented at AAPEX 2018 in these tracks: Business Management, Electric Car & Alternate Fuel/Energy, Heating/Cooling, Heavy Duty, Import/Export, Industry Trends, Paint & Body, Remanufacturing Conference, Service Professionals Program, Shop Equipment & Technology, Technology and Young Professionals Program. Eighteen of the sessions will cover the top trends, challenges and opportunities in the automotive aermarket and how attendees can position themselves to stay ahead of the curve and grow their businesses. Topics include emerging vehicle technologies, shis in vehicle ownership and fleet management, autonomous vehicles and ongoing North American Free Trade Agreement (NAFTA) negotiations. AAPEXedu sessions also will address enabling the connected future and the secure vehicle impact, the digital transformation of China's automotive aermarket, predictive part failure, advanced driver assist systems (ADAS), as well as Transportation as a Service (TaaS) and Mobility as a Service (MaaS). KEYNOTE ADDRESS John King, CNN's chief national correspondent and anchor of Inside Politics, and Karl Rove, political strategist, Fox News contributor and Wall Street Journal columnist, will offer the AAPEX 2018 opening keynote, "Breakfast with John King and Karl Rove: How Trade and the Elections Could Impact the Aermarket." is is a ticketed event and will be held Oct. 30, from 7 a.m. - 8:45 a.m. e grand opening keynote session will begin with a State of the Automotive Aermarket Industry presentation by Bill Hanvey, president and CEO of the Auto Care Association, and Bill Long, president and chief operating officer of the Automotive Aermarket Suppliers Association (AASA). Hanvey and Long will spotlight the trends and technologies that have the greatest impact on the industry today. AAPEXEDU SESSIONS Here is a sampling of the educational sessions planned for AAPEX 2018. 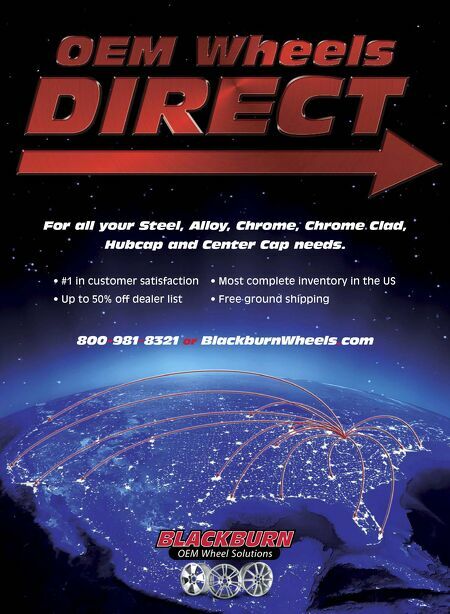 For a complete schedule, see www.aapexshow.com. Tuesday, Oct. 30 9:30 a.m. – 10:15 a.m. Start/Stop Technology, presented by Bob Pattengale, national training manager, Robert Bosch LLC. Start/stop vehicles are already on the road in the U.S. is seminar will cover an overview of start/stop systems, a review of start/stop operation strategy, a review of common components on start/stop systems and diagnostic process examples. 10 a.m. – 11 a.m. 2019 Aermarket Outlook, presented by Nathan Shipley, director of industry analysis, e NPD Group Inc. Shipley will reveal how sales in 2018 are measuring up to expectations, share insights into consumer attitudes that will shape the coming year, and provide his outlook on sales for 2019 and beyond. Insights and analysis will be derived in part from the 2018 Consumer Outlook Survey. In its 13th annual edition, these survey results will once again be unveiled for the first time exclusively to AAPEX attendees. 2 p.m. - 3 p.m. Emerging Vehicle Technologies and eir Impact on the Aermarket, presented by Evan Hirsh, principal of PwC/Strategy. is session will offer a comprehensive review of four emerging vehicle technologies that are certain to affect the aermarket: the development of connected cars, autonomous driving, shared driving, and electrification. 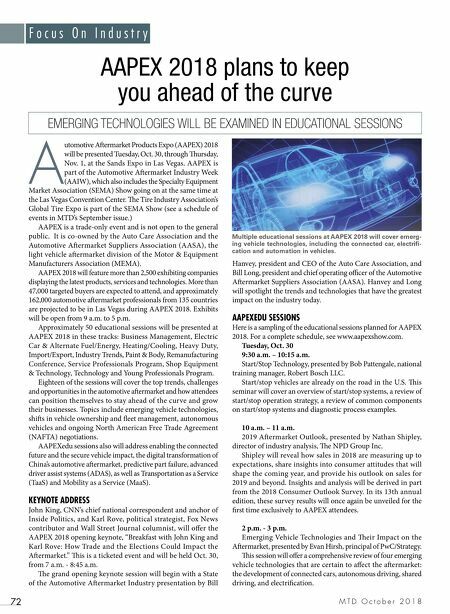 AAPEX 2018 plans to keep you ahead of the curve EMERGING TECHNOLOGIES WILL BE EXAMINED IN EDUCATIONAL SESSIONS Multiple educational sessions at AAPEX 2018 will cover emerg- ing vehicle technologies, including the connected car, electrifi- cation and automation in vehicles.